I go to a Creative Writing Group and some months ago we were given a task of visiting The Turner Gallery in Margate. One of my friends, Karen, also belongs to the Group so we went together, followed by a nice lunch! Yes, two thousand and eleven was the year that I was born. that Margate people don’t like art. Well, who are they to know? but to suggest folk are all philistines was definitely crass. and I plan to stand eternally amidst the wind and ocean’s song. Apologies, but I felt it important to begin with my poem. I know buildings don’t usually write poems but forgive my audacity as I’m not a normal building. I am regal and far-seeing. I am built on a plinth to protect me from the high winds and sea and I am made of six identical interlocking rectangular blocks, with a pitched 20% angle roof. And windows – well, I must be the king of windows I reckon! I call them my eyes and I share them with all my visitors so that we can capture the ever-changing light conditions, reflecting the colours found in Turner’s paintings. I’m named after Joseph Turner who was born on 23rd April 1775 and died on 19th December 1851. He was an English Romantic landscape painter and loved Margate. Some information stuck on my walls says that Joseph used to come here on holiday with his parents from the age of 11. I have also heard since standing here something that surprised me – did you know that until the early 1800s landscapes were rare in England and artists went to Italy or the South of France because of the perceived superior light? Well, after experiencing the Margate skies, Turner changed this idea, and so did Constable. Besides big eyes, I also have enormous ears and a gigantic lift! My ears often hear my visitors exclaiming over the fact that my lift will accommodate 100 people, but it needs to be that large, of course, to carry all the varying sized exhibits. One visitor, I think her name was Gillian, overheard someone say “That was first exhibited in Chatham Dockyard”. On looking around to find the item she saw what she thought was a poem called “Ephemeral Rays” by an art student, Charlotte Smith, but later she realised it was actually a description of Charlotte’s light-bulbs exhibit, which was fascinating. Gillian was quite taken with a sculpture by Irish artist Dorothy Cross. At first sight it looked like a baby basking shark, or what remained of its grey, leathery skin. On closer inspection the stand over which the skin was stretched turned out to be a small boat or coracle, turned upside down. The ribbed boat (called a curragh in Ireland) was draped with the remains of the shark skin, with the keel of the boat fitting neatly inside the shark’s fin. I like having Dorothy Cross’s artistry inside my building – she brings everything together with her quote “The Turner Gallery is another form of landscape”. How can one letter change your life? Not even a word – just one letter of the alphabet. The big C – yes CANCER. How can it hold such dread? when it’s in your radar, threatening a loved one? then the gut-wrenching realisation of its presence. marauders, wanting to build their kingdom, rule your world! and continue to laugh and love as before. My beloved Grandmother (Nanna) was born on 4th August 1896 so, with elementary maths, you can see that on the day World War One broke out, on 4th August 1914, it was her 18th birthday (not that being 18 was celebrated in those days – you had to be 21 to be considered an adult and old enough to be given your own front door key – hence the song “Twenty one today, twenty one today. She’s got the key of the door, never been twenty one before”)! We lived with my grandparents until my parents moved when I was 7. I loved sitting with Nanna in her bedroom, on the ottoman in front of the big window, people watching. She would tell me about certain events in her life, like when she was 4.5 years of age and she and the neighbouring children had skipped down the road singing about Lords Roberts and Kitchener and the relief of Mafeking in South Africa (history, whatever we might think about the Boer War nowadays). She also remembered the funeral of Queen Victoria, although she was only 4 at the time. Why didn’t I take notes to write a book about all this first-hand history when I was older and before her memories diminished – but I never did. Whilst sitting in her bedroom with her my Nanna would often take out a package from a small drawer in her dressing table, carefully unwrap the tissue paper and show me the most beautiful embroidered postcards that her favourite brother, James, had sent her from France, where he was serving King and Country and where he lost his life in May 1916 at the Battle of the Somme. Her eyes filled with tears also when a certain piece of music was played on the wireless as James was always whistling it when he was home. The music was the Intermezzo from Cavallerier Rusticana by Pietro Mascagni. It is a beautiful piece of music and if you would like to hear it you can listen to it on the following YouTube link http://www.youtube.com/watch?v=70vsVSWB4TI. 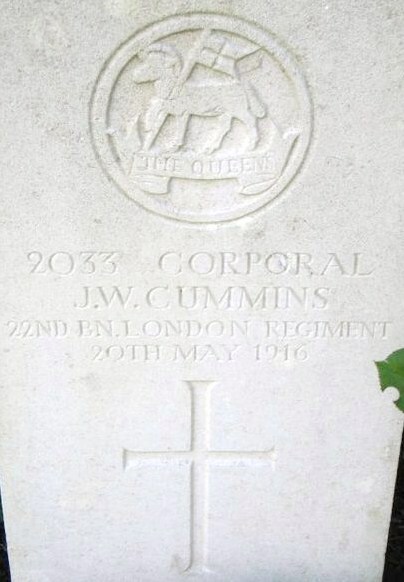 Four years ago I discovered where my Great Uncle James was buried in France – in a place called Bruay, actually in the mainly Canadian War Cemetery, so Dennis drove me, my brother Michael and my sister Jennifer over there to pay our respects and also to honour our Grandmother who had never had that opportunity. Improbably she would be 118 this coming Monday, 4th August, when we shall all be thinking of the many, many lives that were lost or shattered at the start of that War one hundred years ago. Accident Prone or Material for a Comedy? Thought it was time I blogged in a bit of a humorous way after a few woes. As many of you know I have been having problems with my sight and at the moment have very limited vision. Fortunately I can touch type. Investigations are continuing to find the cause but in the meantime I have a healing/relaxation course to follow. About a week ago I decided to listen to it whilst lying on my bed so that I could elevate my legs which are extremely swollen due to the high dose of steroids I have to take. Unfortunately I fell asleep about 5 minutes into listening so I decided I needed to sit in an armchair next time. Yesterday was to be the day as I had a quiet afternoon to myself. However, due to the pain in my legs I gave up the chair and decided I would try the bed again but make sure I stayed awake. So, off I went and elevated the foot part of the bed so that my legs were higher than my heart. I took in my iPad, on its stand, and prepared to start. As I moved it slightly to switch on, the tablet crashed off the stand and smashed down onto my face, hitting my nose and top lip. At first I thought my nose was broken but then a huge egg-like swelling appeared on my top lip and I realised it was cut inside. When Dennis returned he noticed the start of bruising and today he has announced that the bruise looks like a moustache, which as you can imagine is all I need to hear now. But just wanted to share with my friends how my healing course came back to bite me, not in the bum but in the mouth, lol…. 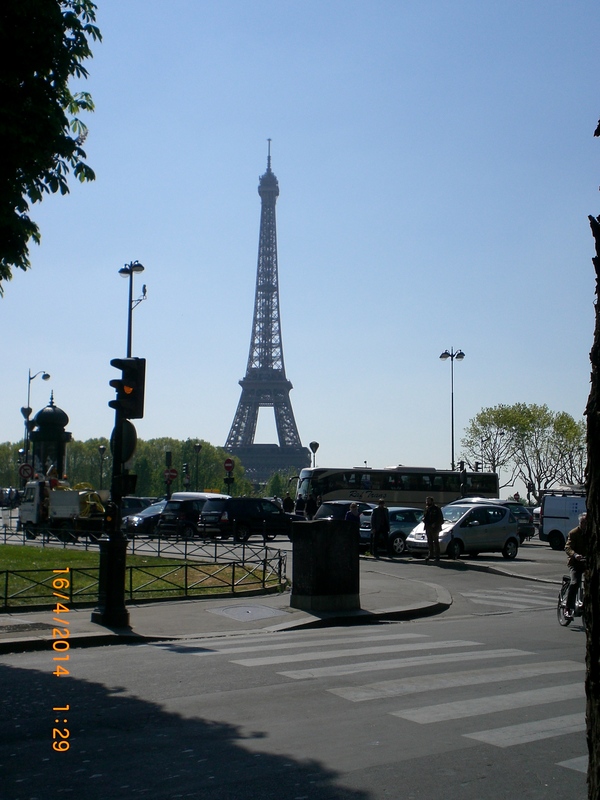 Would we make our long-planned trip to Paris – I didn’t know. 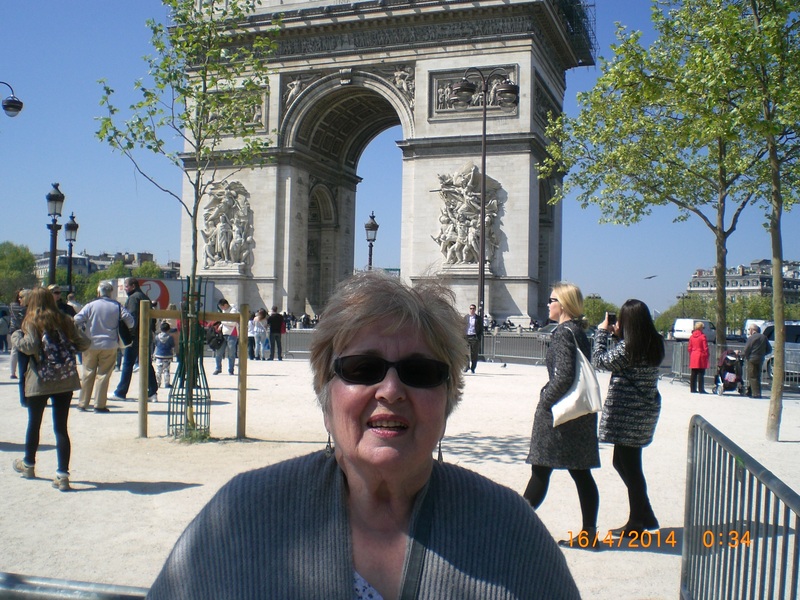 Long before the problem with my sight had occurred Dennis had booked for us to be in Paris for his birthday in April but I was suddenly faced with a tranche of hospital appointments. Luckily everything fitted around the 2 days we needed, so off we set at (groan!) 4.30am to get to Ashford International Station by 5.30am. Neither of us had travelled on Eurostar before and it was quite exciting when the train pulled in. 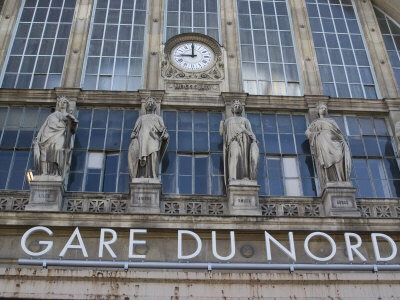 It took about 2 hours to Paris Gare-du-Nord Station. We put our overnight luggage in the Station locker and walked the 15 minutes to our hotel. 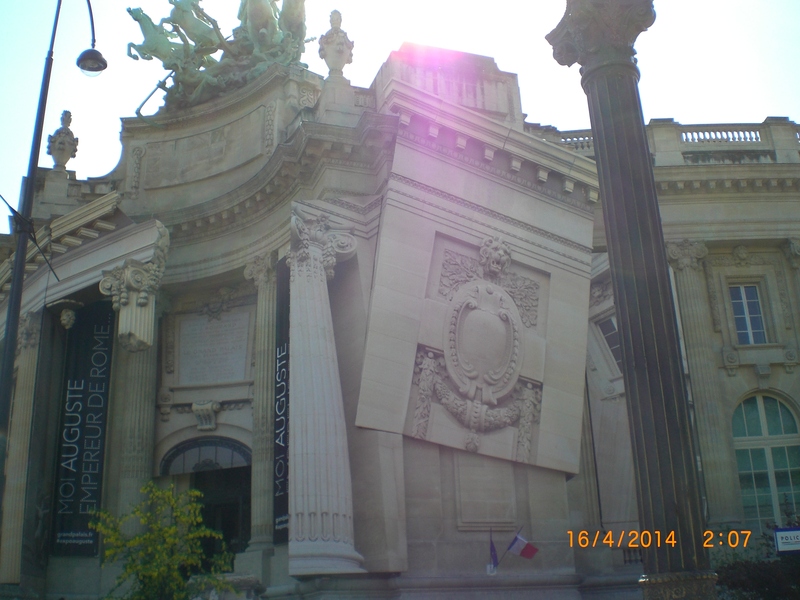 It was about 9.30am French time and beautifully warm and sunny. A nice cup of coffee was in order and Dennis enjoyed a cafe au lait whilst I had a double expresso! We decided to explore the metro for travelling and once we (or Dennis!) had worked it out we found it quite simple. 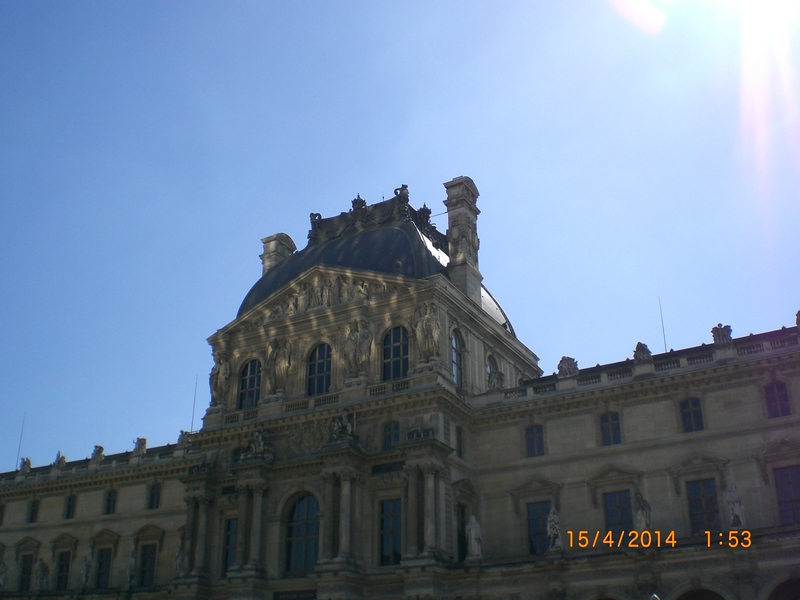 We went from Louis Blanc to Le Louvre (all the fares were 1.70 euros single) and then started our (for us) marathon walk. 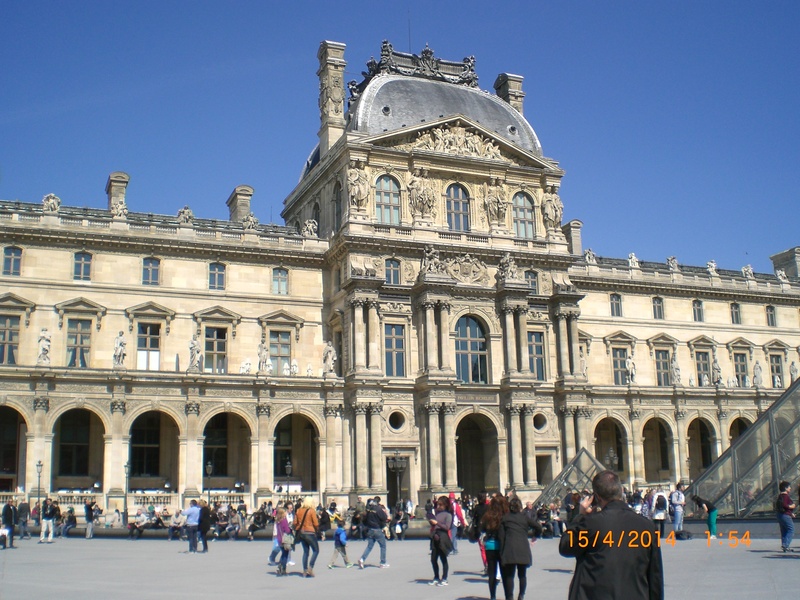 The Louvre is an amazing building – everything in that part of Paris seems so ornate, with statutes everywhere, even on rooftops. 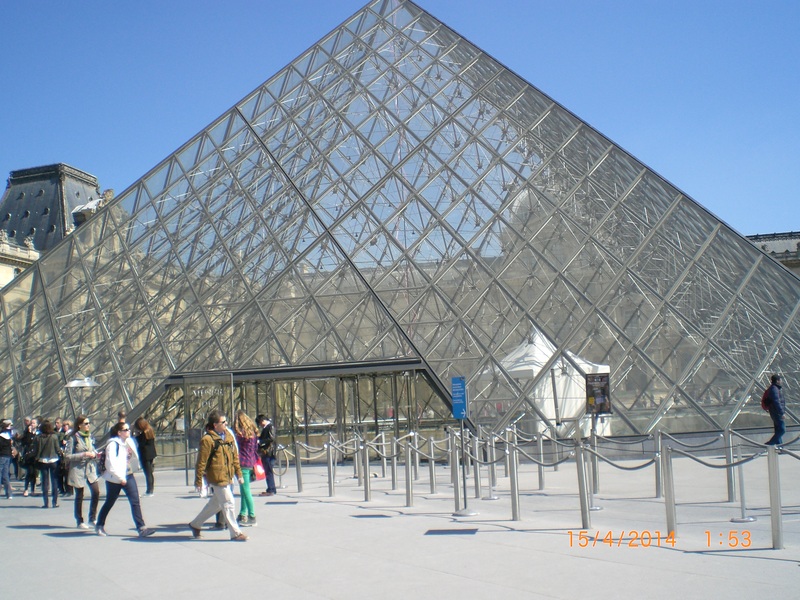 Outside of the building are 3 glass pyramids, in decreasing sizes. I didn’t even know of their existence but Dennis knew of them via The Da Vinci Code film. We then walked through the Tuileries Garden. 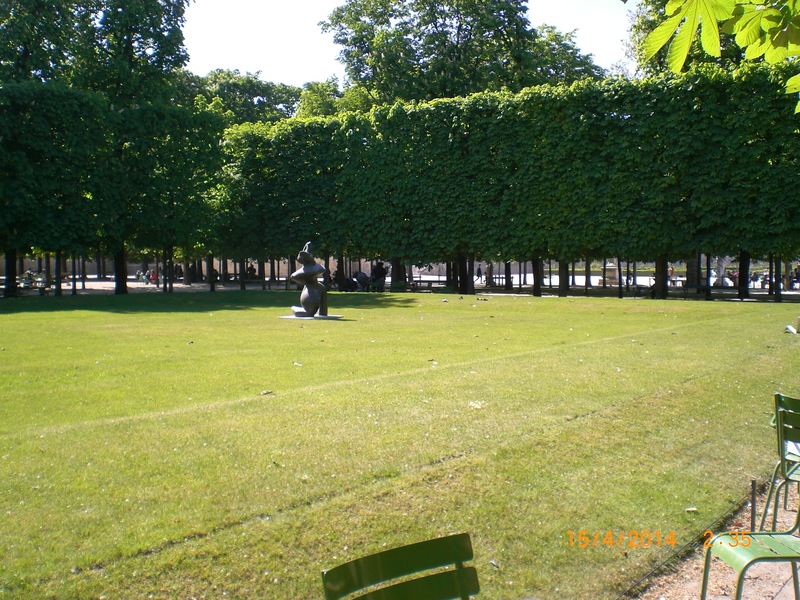 Jardin des Tuileries is spread with fountains, and sculpture, cafes and meeting places, formal gardens and seating. These tranquil gardens have a bloody history though. Louis the XVI and Marie Antoinette were held prisoner in the palace, after being routed from Versailles during the French Revolution, and the siege at the Tuileries by the Parisian mob at the close of the revolution in 1893 left a thousand dead. Seeing the profligate extravagance of the King and aristocrats it really isn’t surprising that the people rose up against it. They were in abject poverty, starving and being dispossessed of their homes, all to add to the Court’s whims of avarice. 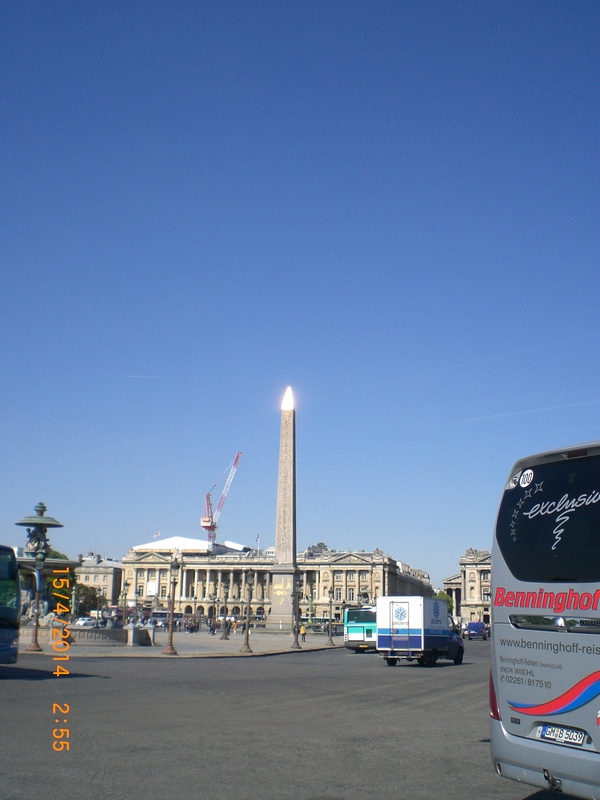 The obelisk below was where the guillotine was set up. 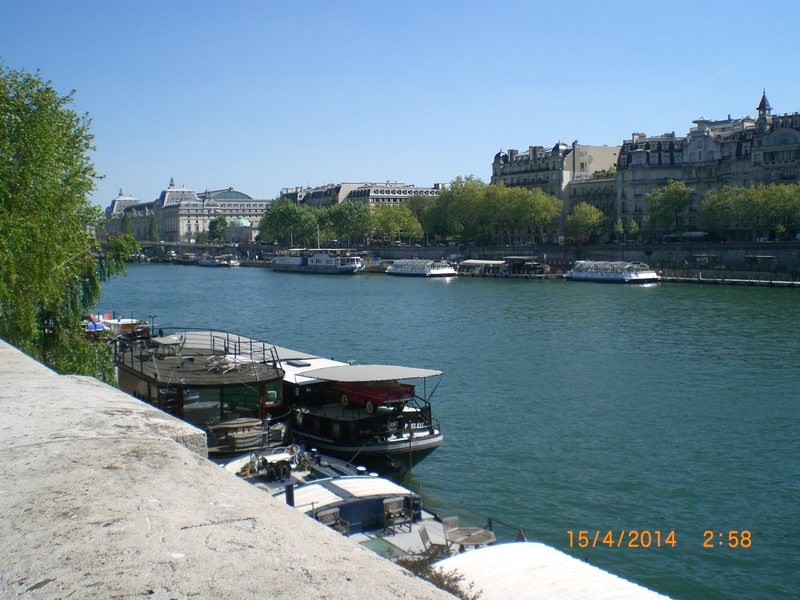 We walked beside the River Seine, passing over one bridge with some Parisians on what I think are called Windrunners or Personal Transportation Robots? We took a photograph anyway. We had a great first day, enjoyed a nice meal out that evening and went back to our hotel for a drink in the bar before sinking into an exhausted sleep! 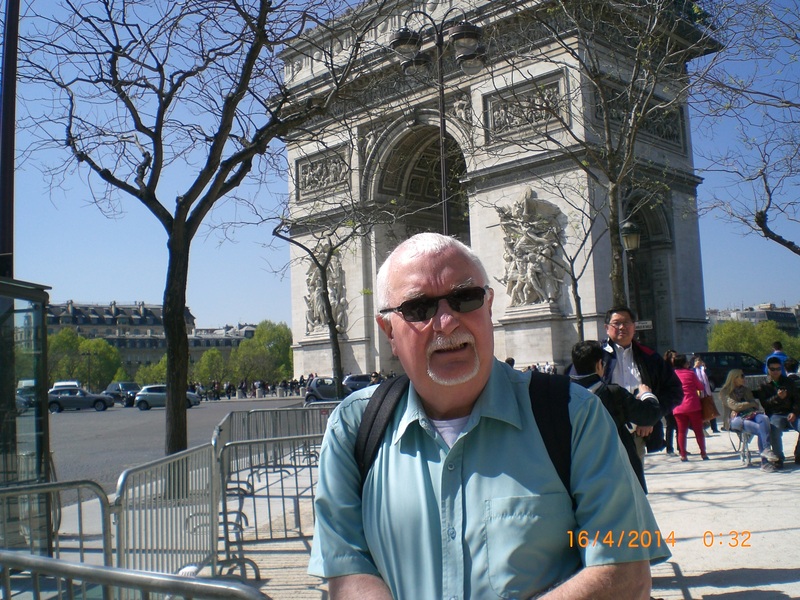 The following day was Dennis’ actual birthday and we had planned to go to the Tour Eiffel via the metro and to walk around the Arc de Triomphe – but oh dear, our achy legs told us a different story: we had overdone the walking on day one. 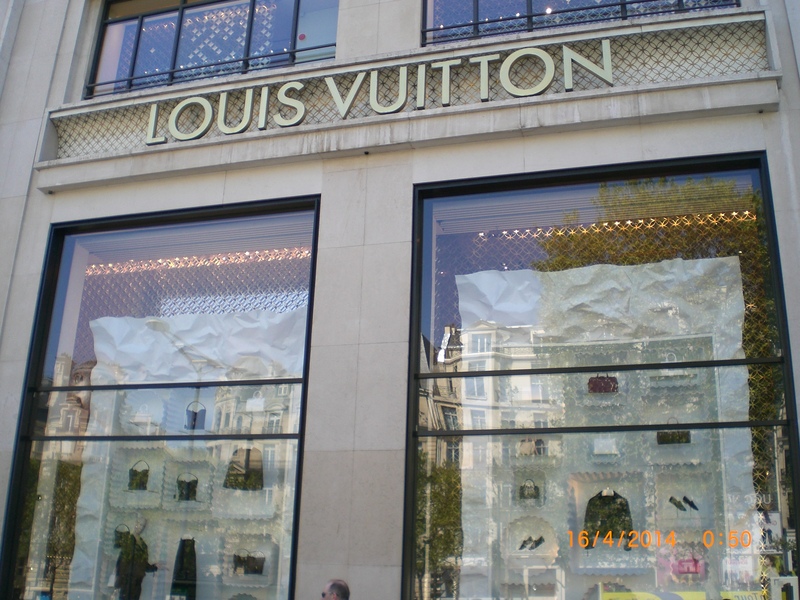 After a leisurely continental breakfast we took the metro to the Arc de Triomphe and took some photos, then strolled down the Champs de Lyse and window shopped in Luis Vuitton and Yves Saint Laurent – trop cher! Because I have limited vision now I sometimes see things that are not there as well as not seeing things that are there! Can you see the big cat in this photograph? I could see it on the building but Dennis couldn’t. However, when he downloaded the photographs later he could see what I had seen, with the windows being the gaps between the cat’s legs. It’s actually a reflection from one of the glass pyramids! We caught the 7.00pm Eurostar back (French time) and arrived at Ashford International at 8.10pm local time, picked up our car from the multi-storey car park and were back home by 9.00pm. 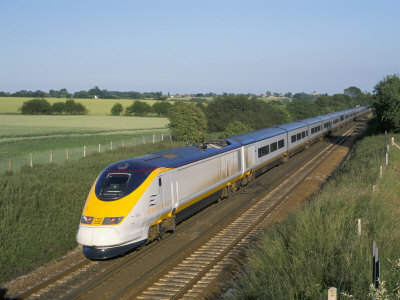 We were so fortunate because the following day there was a 6 hour delay on Eurostar, which would have ruined our trip. 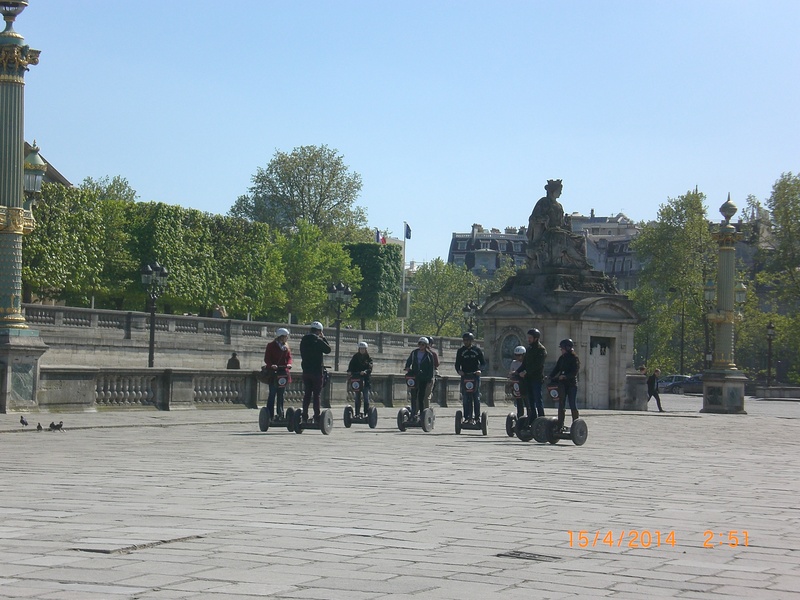 We were lucky and thoroughly enjoyed our sojourn in Paris. Monday 10th March 2014 – What do you put in a blog? I have several friends and people I follow whose blogs I read with interest, but they write mostly about their family. My question is, what if one’s family isn’t keen to be mentioned? This removes a lot of interesting news and stories I think, but I have to respect people’s privacy. How do other bloggers get over this? One thing I can write freely about is my Creative Writing Group and today I feel very excited as some of my work is about to go into an Anthology which is probably to be published as an e-book. Watch this space! The dentist’s wasn’t such a nice event this afternoon, but the journey there in the glorious sunshine was, passing fields and hedgerows, some trees in blossom, smiling faces – all pointing to Spring, such a season of hope. Reflections are in my mind today, mainly because we have been fitting some new curtains, really just as “dressing” over the new blinds we put up when we moved into this flat. We need lots of light in here so we’ve gone for white. This means that the sun can reflect back into the room and cheer us! Reflections also came to the fore in my Creative Writing Group yesterday. Our homework had been to study a painting by Peter Doig titled “Pond Life” and write a story about someone stuck in a top room of the house in the picture, looking out of the window to the lake, or pond, below. The pond was full of reflections of the house itself and the tall, spindly trees of the surrounding woodland. There were two figures standing on the frozen water. It was amazing how different our stories turned out to be when we read them out. I attach my effort! The old Colonial house with its many eyes, watching over the pond for as long as anyone could remember; a guardsman left behind from British colonial rule of this north-east corner of Western Canada. And all this time standing, silently observing. What secrets has it to tell, I wonder? As for me, how long has it been now? The days just run into each other and I forget, but it must have been 5 years since I was able to leave this room. Forget time though or it will drive me mad. Look at the pond. Yes, the pond that is full of life and movement; the pond that has saved my sanity. Sitting in my chair by the window, high up in the house, I have a perfect view. Not just of the pond though – I’ve been watching the swallows who come here every year to build their mud nests and have their babies, their little fledglings tumbling out of their nests onto the guttering, steeling themselves to let go and fly! Why can’t I just let go? Children come to the pond with their little nets and pockets full of bread for the overfed ducks. I love watching their antics, it brings life into my room. Sometimes in winter the pond freezes over and when the Warden puts up the sign to say it is frozen enough for skating lots of young people arrive, wrapped in woolly hats and scarves and tiptoe onto the natural skating rink. I watch the funny slip-sliding of dogs who venture onto the glassy surface, legs asunder. The events are the same and yet a changing tableau each winter. This year it is very different though. Just two children there, I think maybe a brother and sister. I watch in horror the event unfolding, the screaming of the little girl as her younger brother breaks through the thinner ice mid-pond. I am powerless to help but I know there is a double tragedy looming as the girl will surely join her brother if she gets on the weak ice to try to rescue him. Where are all the other people? I see her shouting and looking around. The boy is going under again and will surely become too weak to lift himself up. My legs are shaky from lack of use but somehow they are carrying me down the stairs and out of the door. The winter sun makes my weak eyes water and I can’t see the children but I can hear the girl sobbing. The wooden signpost is frozen into the ground. I desperately call the girl to come over to me, to walk on the outside of the pond, on the thicker ice. We stand each side of the signpost and frantically pull it from side to side, some superhuman strength allowing us to loosen it and pull it free. I slide the wooden post to bridge the ice, send the girl to get some help from a neighbouring Trapping Post, and slowly edge myself along the wood towards the boy. I can just see the top of his blue hat and I pray that he is still in it. I feel for him and his body feels lifeless and cold. The intensity of the cold renders my hands and arms helpless but I know I have to get him out. I manage to hook his arms over the edge of the hole but I cannot lift him so I cling onto his red jacket, praying that help will come soon. The Trappers’ truck screeches to a halt and two men drag ladders from the back and lay them on the ice at right angles from me, one to the left and one to my right and between them lift the boy from the water. The flying doctor arrives and the boy is wrapped in foil and rushed to the nearest hospital. Hope you enjoyed the story. Have a lovely weekend everyone. USA ……… here we come! I am so excited; after months of dreaming and planning, today we finally booked our flight to the United States of America – yay! Whilst we are away later in the year my sister and brother will be house-sitting, plant watering and enjoying our local beaches, but we will be travelling through Virginia and North Carolina and also visiting Dennis’ cousin Gloria and her husband Keith whom I have never met and Dennis last saw about 50 years ago! I have long had a dream of sitting in a big windowed restaurant overlooking the ocean whilst eating the large, succulent lobsters to be found there – and perhaps sipping champagne! Is that too indulgent do you think? I hope not, and after working for the past 55 years until I retired last June, maybe I’ve earned it? I have never been to America before, nor on any long-haul holiday so I’m so looking forward to it – and we’re going for 4 weeks! I am slightly apprehensive about the flight but hopefully there won’t be much turbulence as I’ve never been a “big-dipper” kind of person! Our final week will be spent sight-seeing around the Chesapeake Bay area and then home. If any of my readers have been to Virginia or North Carolina I’d love to hear of your experiences – or tell me where else you’ve been in the USA. I have just read my friend Nanny-Cool’s blog about “baby-sitting” her grandchildren and attending their Nativity play in the local Church. My grandchildren are all grown up now but I was so reminded of when they were little and we went to watch them being sheep, shepherds, kings, wisemen, angels, Joseph and even Mary. Such special times and so moving hearing them sing the Christmas Carols they had obviously practised over many days. I was delighted to know from Nanny’s blog that some schools are still performing Nativity plays and teaching the children what CHRISTmas is all about. Some years ago one of my friend’s went to her son’s school’s Nativity play. The child who was playing Mary had just had a new baby brother. No, they didn’t use him to play baby Jesus, but his new presence in her life had obviously made an impression because in their little play the boy playing Joseph came onto the stage and asked “How’s baby Jesus today Mary?” at which the little girl playing Mary (and presumably relating it to her own life and a conversation between her mother and father) said “He’s not stopped crying, he’s been a right little bugger!”. As you can imagine, it brought the house down!